Planning and Sustainable Land Use Committee meetings are held in the Council Chamber at 9:00 a.m. on the Wednesday prior to the first and third Fridays of each month; however, the schedule is subject to change. The Committee may also periodically schedule site inspections. 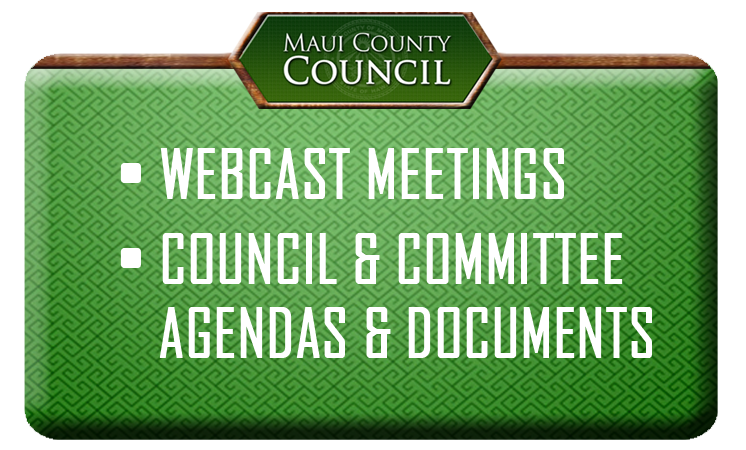 Project-specific amendments of State land use district boundaries, the General Plan, community plans, and zoning designations, except district boundary amendments specific to Chapter 201H, Hawaii Revised Statutes, projects. Other land use entitlements requiring Council review and approval, such as Conditional Permits. Land use ordinance not specific to a project, except amendments to the Parking Code. Processing procedures for the General Plan and community plans. Non-project-specific amendments to the General Plan and comprehensive community plan updates. Appointments to community plan advisory committees. Implementation of the digital mapping project. Operations and performance audits of the Department of Planning and the Maui Emergency Management Agency, including the operational oversight of any grant they administer. Implementation of the following General Plan objective: Promote Sustainable Land Use and Growth Management.